They’re yummy and easy to do…salads are the most refreshing picks for those who want to shed a few pounds through healthy eating. Aside from helping you maintain fresh, glowing skin, salads are light but filling. They are also perfect sides to pair with your favorite dishes. •	Ingredients: 1 King Sue Pear-shaped Ham, 1 cup cheddar cheese (diced), 450 g pack elbow macaroni (cooked elbow macaroni: al dente), 1 cup parmesan cheese grated, 1 cup chopped celery, 1 onion (chopped), 1/2 cup raisins, 1/2 cup dill pickles (chopped), 1/4 cup mayonnaise, 1/4 cup miracle whip, 2 tsps prepared mustard, salt and pepper. •	Cooking Directions: Dice King Sue ham into 1/2-inch cubes (or bite-sized). 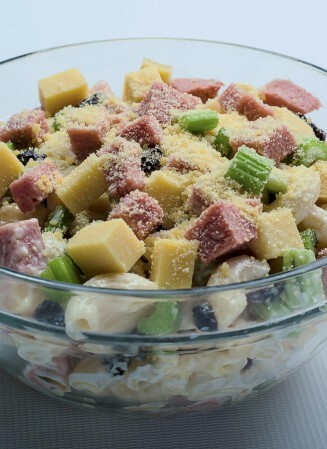 Combine ham and cheese with macaroni (previously boiled and softened), celery, onion and pickle, raisins. Mix in the mayonnaise and mustard; then add salt and pepper to taste. Stir into macaroni mixture, and mix all ingredients well. Top with parmesan cheese and Chill (for several hours for maximum flavor) until ready to serve. 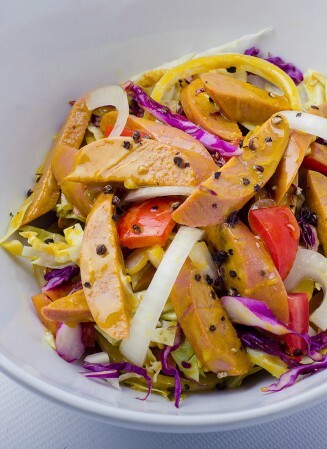 •	Ingredients: 1/4 cup yellow mustard, 2 tsp juice of Lemon, 1 rounded teaspoon granulated sugar, 3 tbsp Olive oil, 1 small white onion, thinly sliced, 1 small cabbage, shredded, 2 tomatoes, diced, 2 tsp pickle relish, salt and freshly ground pepper, 3 pcs King Sue German Franks sliced diagonally. •	Cooking Directions: In a large bowl, combine the mustard, lemon juice, sugar and Olive oil. Add in the onion, cabbage, tomatoes and pickles, then toss. Season with salt and pepper. Heat a large nonstick skillet over medium-high heat. Pan-fry the hotdog slices and scatter them on top of the salad. 3. SALAD WITH BERRY DRESSING TOP WITH SWEET HAM. Feasting but not fasting on flavor—this is what you get with this salad in sweet, creamy berry-based dressing. •	Cooking Directions: In a mixing bowl, mix all ingredients for the dressing and whisk until well-blended. 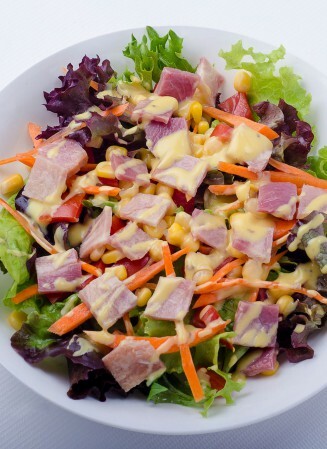 Toss the salad greens, carrots, tomatoes, corn and ham together. Drizzle with the berry dressing. Serve in attractive salad bowls. 4. FRUITS-AND-HAM SALAD. Ham goes well with anything; you can even pair it with your favorite fruits. Brighten up your bowl with fresh fruit salads mixed with King Sue Sliced Hawaiian ham. 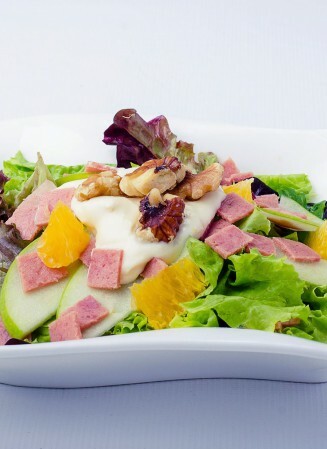 •	Ingredients: 2 Green Apple (or any fruit you like), 1 orange segmented, juice of 1 lemon, 300 gms King Sue Sliced Hawaiian Ham, 1 cup sour cream, ¼ cup all-purpose cream, ½ tsp sugar, 3 tbsp parmesan Cheese, 6 cups or 1 pack of mixed greens, Walnuts, Freshly Ground Pepper, Salt. •	Cooking Directions: Thinly slice the apples. Toss with lemon juice in a large bowl. To make the dressing, combine sour cream and all purpose cream, sugar with salt and pepper. In a large bowl, toss together the mixed greens, King Sue Hawaiian Ham, apples, pineapple juice and orange. Top everything with walnuts and parmesan cheese.